I take to heart the adage that beauty is the greatest form of protest. Working en plein air, I attempt to take what I observe in nature and translate it into a language of personal expression and universal significance. I consider myself an explorer of specific terrains, studying the atmosphere of diverse spaces. In these times of environmental and societal devastation, I consider it a political act to immerse myself in the landscape to record the natural beauty lurking there, perhaps to incite the arousal of sentiment, a stirring of connectedness. My work combines perception in the moment, memory of past space, and aspiration of future place. New York's Hudson Valley, Italy, and Florida are among the places I explore through plein air drawing. My oil pastel drawings function as research for studio works that are either watercolor, oil paint, or oil pastel and watercolor combined. This travel research of plein air drawing and painting gives me the information necessary to produce new studio works, which combine elements from all the landscapes I explore. 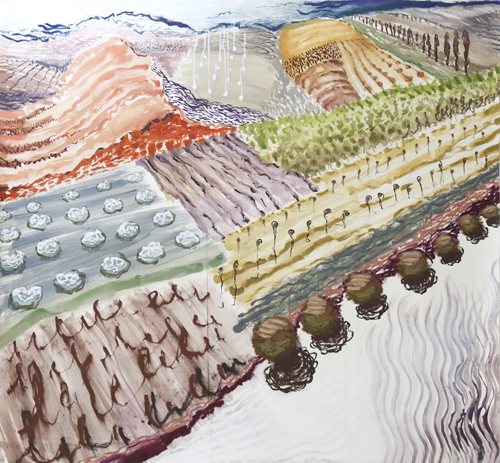 New York’s Hudson Valley contributes distant mountains and rows of cornfields; the landscape of Italy’s Crete Senesi has given my work the twisting, intertwining, ordered, pattern-infused hills; Florida’s flora and flat space has given my work an intensity of light and color as well as a sense of temperature. In my work, observational gesture meets abstract mark-making, creating an ordered chaos of the natural world. Lily Prince is a graduate of the Rhode Island School of Design and the Bard College Milton Avery Graduate School of the Arts. She is a Skowhegan fellow, teaches at William Paterson University, and has exhibited both nationally and internationally. Lily has had numerous commissions and publications including covers for the inaugural and second issue of the literary journal Crossborder, as well as illustrations for the forthcoming book Abstract Expressionism for Beginners (Beginners Books). Her work has been reviewed in The New York Times numerous times and reproduced in many publications. For more information, please see www.lilyprince.com .